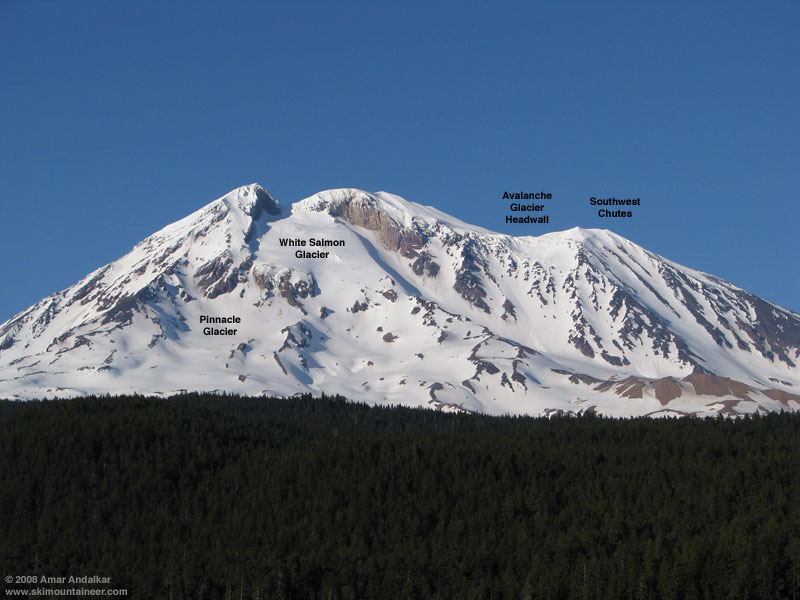 Avalanche Glacier Headwall is a slightly-steeper, somewhat-shorter, WSW-facing, and mostly-ignored near-twin of the much-famed and far-too-popular Southwest Chutes on Mt Adams. From the saddle between the false summit (Piker's Peak) and the main summit, several parallel chutes descend the headwall above the Avalanche Glacier, holding a pitch of over 40 degrees for more than 2000 vertical feet. I'd had my eyes on this route for at least a half-dozen years, taking photos time after time after time from the fine western Mt Adams viewpoint on FR 23 (11 miles north of Trout Lake). 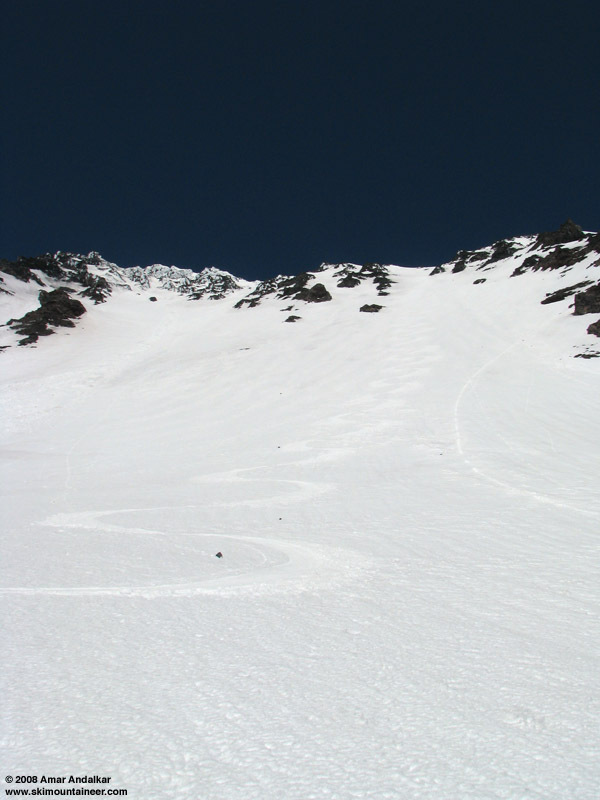 However, most years the route looked a bit too thin for comfort by the time I'd make it down to Adams in June or July, and each time I'd skied something else instead, usually the SW Chutes. View of the west side of Mt Adams from FR 23 after our trip. This time, an indirect view from Trout Lake on Friday evening before our Long Distance Runaround trip showed excellent coverage on the Headwall, with several of its chutes looking fat and in prime condition. This was confirmed during Saturday's trip with a close-up view from just below the western moraine of the Avalanche Glacier. The route was definitely IN. However, the exhaustion, dehydration, and severe foot pain brought on by the 20-mile, 6600-vert Runaround threatened to derail plans to ski it once again, and we went to sleep Saturday night quite uncertain what the next day's agenda might be. 7:15pm on June 14: Something is looking good for tomorrow . . .
Avalanche Glacier Headwall at center, with White Salmon Glacier at left and the Southwest Chutes at far right. We slept in late, but awoke to discover very happily that most of the damage and dehydration from yesterday's trip had been temporary, and that we were almost fully recovered. We decided to just head up the mountain and see how far we'd get, finally skinning up from our 6150 ft camp at 9:45am. Jason and Josh headed up the standard way via the steep bowls beside Crescent Glacier (which had three small slab avalanches visible from the previous day), while Dave and I opted for the variation farther east going past South Butte and Lunch Counter. We met up again near 9500 ft and skinned up the South Rib to 10100 ft, before booting the rest of the way up to Piker's Peak by 2 or 2:30pm. We considered heading for the summit, which looked to have smooth and inviting snow, but the late hour and thoughts of a long drive back to Seattle-Tacoma with work looming the next day (for three of us, at least) convinced us to forgo that hour-long side trip. 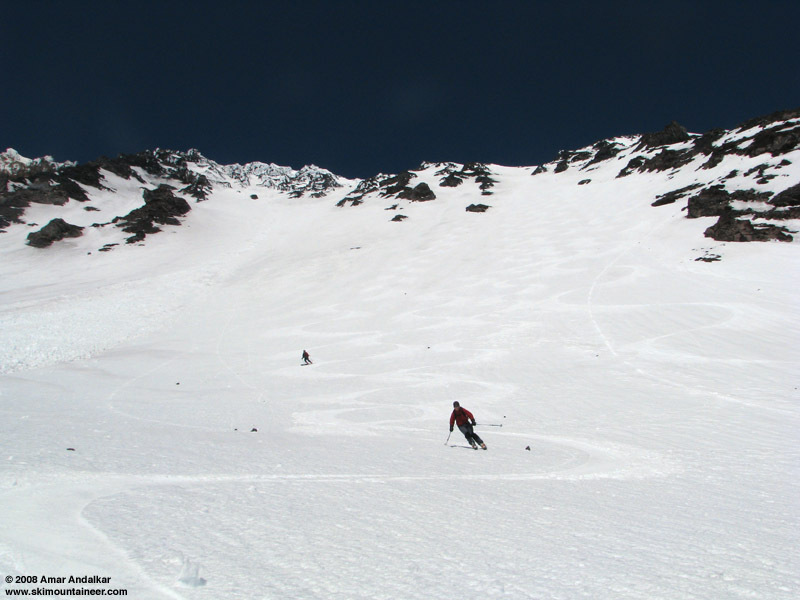 After a brief discussion, we decided to ski the Avalanche Glacier Headwall. with Mt St Helens far below in the distance. We skied down at 3pm, initially on icy mini-sastrugi and small ice fins covering the snow surface just north of Piker's Peak and on the west slope of the saddle. The uppermost portion of the route from 11600 to 11200 ft is a broad, open, gently-sloping bowl, but then there is a sudden transition and a radical change in character. A short (50-100 ft), steep (45 degree) entrance slope between heavily-rimed rock outcrops drops you into the upper portion of the Headwall, a single 35-degree slope spanning most of the width of the Headwall and covering another 600 vertical feet. On this warm sunny afternoon, the snow also transitioned immediately as we went over the roll, changing from the mostly icy nasty stuff above to excellent corn softened just the right amount for high-speed ripping. Mt St Helens below in the distance. Then the real fun begins: another rollover near 10600 ft, and the slope steepens to 40+ degrees, splitting into several parallel chutes separated by discontinuous rock bands. The leftmost chute is the most direct and most sustained, maintaining its steep pitch for nearly 2000 vertical feet of outrageously perfect corn. The others were dillydallying up above, and I just couldn't wait any longer, so (quite out of character, sorry guys) I let it rip and skied the entire chute in a single sustained run of big GS arcs, all the way down to the flats of the Avalanche Glacier. Two of the finest minutes of skiing bliss I've ever experienced. Someone skied the whole chute nonstop to snag first tracks . . . The others eventually realized what they were missing: after resting for several long minutes at the bottom, I finally saw them coming down. They soon joined me for a long break at the foot of the slope, and all of us agreed that it was one of the nicest runs we had ever skied. And what about snow stability concerns, especially given the repeated whumping and surprising remote-triggered avalanche of the previous day? Along with the several slabs we saw on other parts of the mountain, we could see as we crossed below the Headwall that some large sluffs had run down the chutes on its northern side, producing a large pile of debris at the bottom. We considered snow stability before attempting the Headwall, and decided to take a moderate risk in order to ski the line. Another day of strong melt-freeze cycling had apparently settled things down, and we heard or saw no further activity and no sluffs or slabs. This time, the risk turned out to be a good one, and stability was fine for our descent. Zoomed view of the Avalanche Glacier Headwall and Southwest Chutes from FR 23 after our trip. After skiing the Headwall, we continued down the Avalanche Glacier in slightly stickier snow, but eventually found another long slope of perfect corn below 8000 ft. We rejoined our route from the previous day near 7500 ft and followed the same high traverse out to the ridge west of Crescent Glacier, and then back to our camp by 4:30pm. An hour later, camp was in our packs and we headed down the dirty, forest-debris-covered snow of the trail and road, taking the skis off for a couple of long bare stretches but eventually skiing down to 4650 ft and within a few hundred feet of the car by a willingness to ski across many short bare and muddy sections. The exit: skiing down the road. Total ascent for the day was about 5800 ft (including the 300 ft gain on the exit traverse from the Avalanche Glacier basin), for 7100 vertical ft of ski descent, bringing the weekend total up to about 14000 ft of ascent and 13600 ft of ski descent. And another long-sought route finally skied, best of all in prime snow conditions. I spied some of those chutes recently in a photo my friend took of Adams and we talked about it.� Way to hit it up!� That looks like an excellent run!� Great tr, and great photos as well Amar! Great to have some beta on an area not often looked at, much less tackled!